Roads? Where we're going we don't need roads, we need walls, ceilings, and space itself. 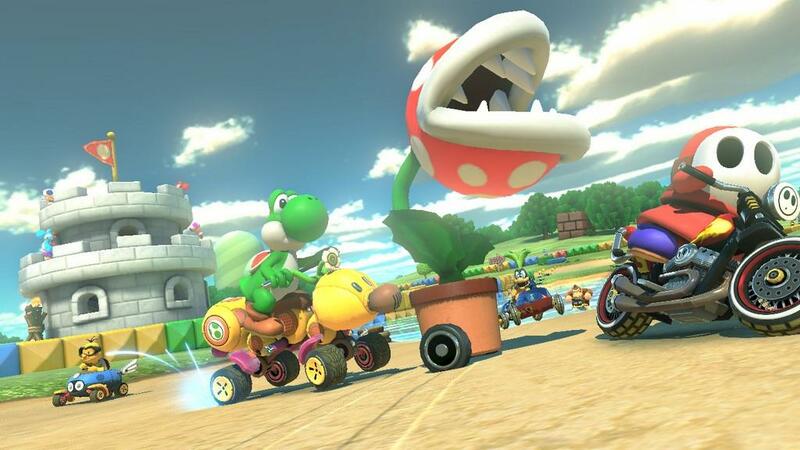 Mario Kart 8 is as much about pushing its own boundaries as it is about retaining all that classic Mario Kart feel that has been honed over the past two decades. Playing Mario Kart 8 for the past two weeks has been an absolute joy, and that was before I decided to try it with some friends. 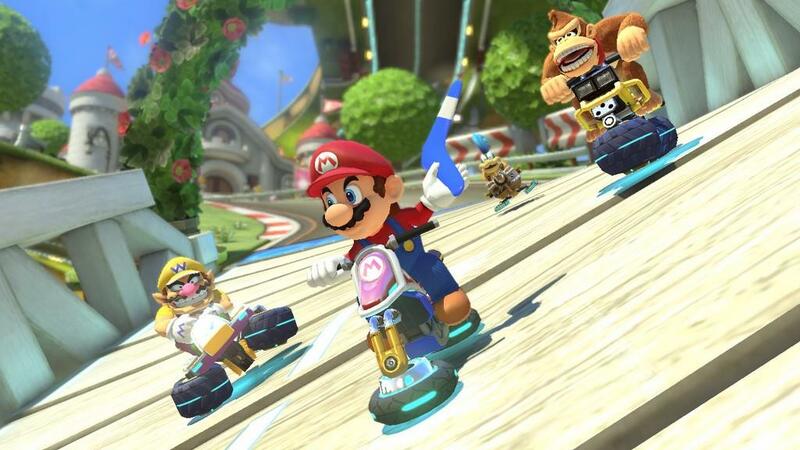 Sure the online multiplayer option was there if I was feeling truly competitive, but when it came to just having fun, inviting some friends over for Mario Kart 8 felt like a call-back to the days of the N64, when Mario Kart 64 was some serious business for a group of high-school kids. 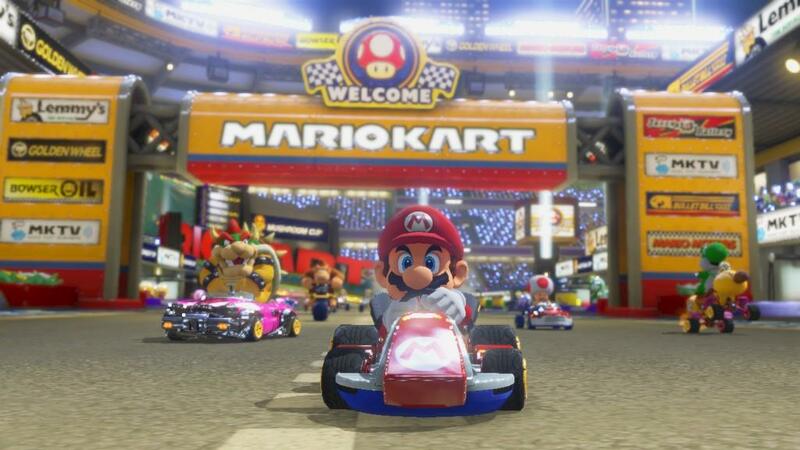 We may have aged, but the gameplay of Mario Kart remains largely unchanged from those childhood days, and there's really nothing wrong with that. 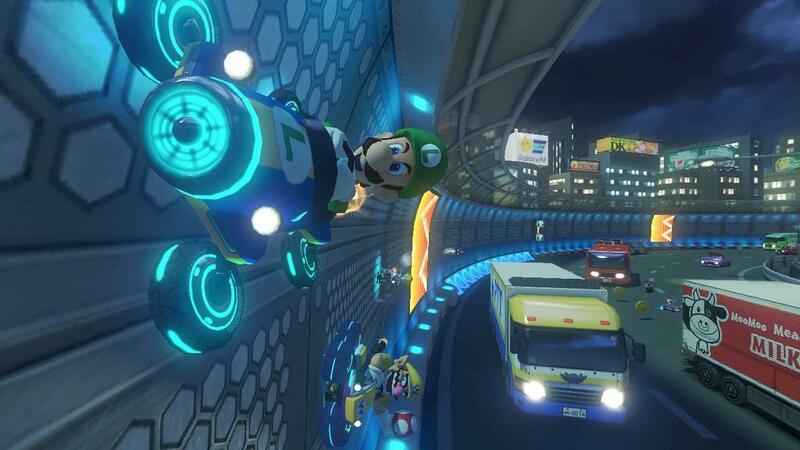 The biggest change to Mario Kart 8 over previous iterations is the new anti-gravity racing capabilities that have been given to the karts. This means that you're no longer constrained to the normally level tracks, you can now race upon walls, on the ceilings, and portions of the tracks that would normally be untraversable. 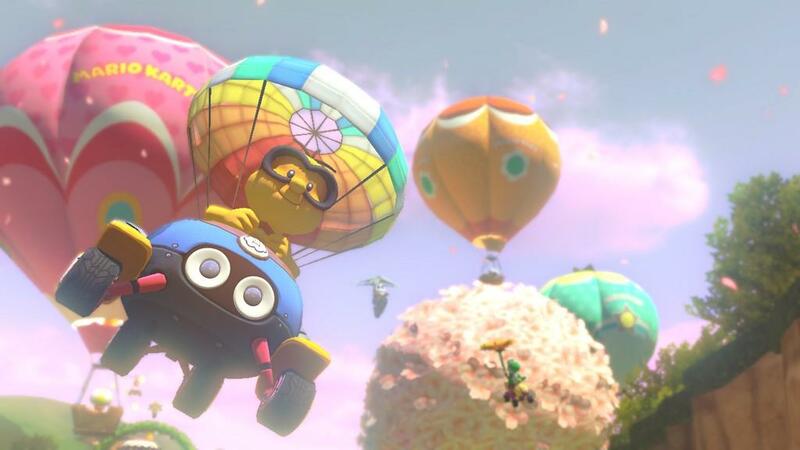 This new dynamic doesn't fundamentally change how the game is played, but it offers a new way to race in a way that feels natural, and it's really amazing how well Nintendo has pulled this off. The anti-gravity portions of the track feel very deliberate in their execution, as if doing them any other way would have had an overall negative impact on the experience. And it's not just the track design that's able to sell this gameplay mechanic, but the presentation to the player is also spot on. With camera movement that never feels jarring or lacking, the transition from a normal track surface to anti-gravity is smooth and gentle, making the transitions almost seamless. 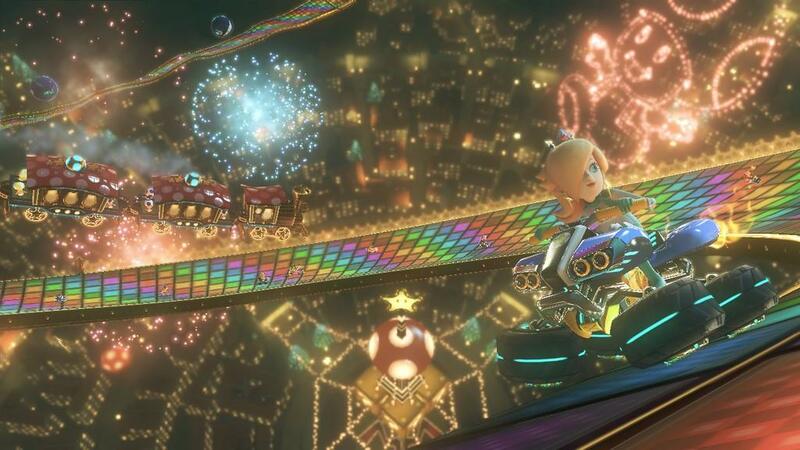 The additional visual touches really sell the fact that you're not racing on traditional terra firma, seeing things like Daisy, Peach, or Rosalina's hair dangle curiously upward, and citizens of the Mushroom Kingdom cheering on from floating platforms all go a long way to convincing you that you're not in your typical Mario Kart race. The tracks themselves cover a variety of new locations in the Mushroom Kingdom, with sixteen new tracks, and sixteen remixed classic tracks, you've got a ton of places to see, and if you count the mirror courses, you've got sixty four tracks in total to choose from. Even if races don't last typically for more than five minutes, there are enough courses and configurations to give you easily dozens of hours of play time. The new tracks all feature some kind of anti-gravity gameplay, whether it be the walls near the top of the hill in Toad Harbor, or the möbius strip inspired Mario Circuit, the feature is worked in to every stage and doesn't ever really feel forced. There are a few tricky corners, but those are typically saved for Rainbow Road. All in all, none of the new tracks are going to be taxing for any serious racers, but they provide just the right amount of challenge, and still take quite a bit of effort to perfect. The sixteen classic tracks have also been slightly remixed, some of which have been given a little bit of anti-gravity treatment, others have just been given an HD coat of paint. The selection of tracks also features some classics like Donut Plains 3 from the SNES original, and the Rainbow Road from Mario Kart 64 (although it has been modified to be a single lap race). These remixed courses also implement some of the new gameplay elements introduced in Mario Kart 7 and Mario Kart Wii, Peach's Castle for instance from the N64 era no longer just has a long bland jump in the middle but instead uses the new gliders and has coins available for players to grab during their descent. Earning a gold medal in all of courses in each of the three difficulties unlocks the series stable, Mirror Mode, which flips everything over, effectively doubling the number of tracks, albeit in a cheap way. Kart customization is making a return from Mario Kart 7, and continues to offer a ridiculous number of configurations. It starts off with your character, and this time around you've got thirty characters to choose from. This includes your Mushroom Kingdom staples, Mario, Luigi, Princess Peach, Daisy, Wario, Shy Guy, Bowser, Donkey Kong, and a few more. The initial roster starts at sixteen, and starts to grow as you complete more and more circuits. Bowser's kids, the Koopalings make their Mario Kart debut and really round out the roster and provide a good counter to the large number of babies in the roster, not that I have a problem with them being playable, five just seemed like too many. Getting back to the point, these characters make up six different weight classes to get your started. The babies are obviously the lightest, and the heavyweights include Bowser, Metal Mario, and Pink Gold Peach. Once you've selected a character it's time to start putting your ride together. The options here are pretty staggering, and they keep growing as you collect more coins while you race. You've got karts, bikes, ATVs, and land ships, each offering a different way to play the game. Karts are your all around vehicles, bikes are great if you want to focus on speed but require a little bit of finesse, ATVs are useful if you find yourself going offroad more than you'd like to admit, and the land ships are perfect for muscling through the competition. After that you're not done yet, because you've also got to select some tires that will assist in handling, acceleration, and top speed. And then to top if all of you've got a glider to pick, which will affect the overall weight, and that's about it. You can make very specific builds to suit your play style, and I found myself settling with a great combo of Rosalina on a bike with some high end tires. I slide all over the place, but have just the right amount of control for whipping around corners. 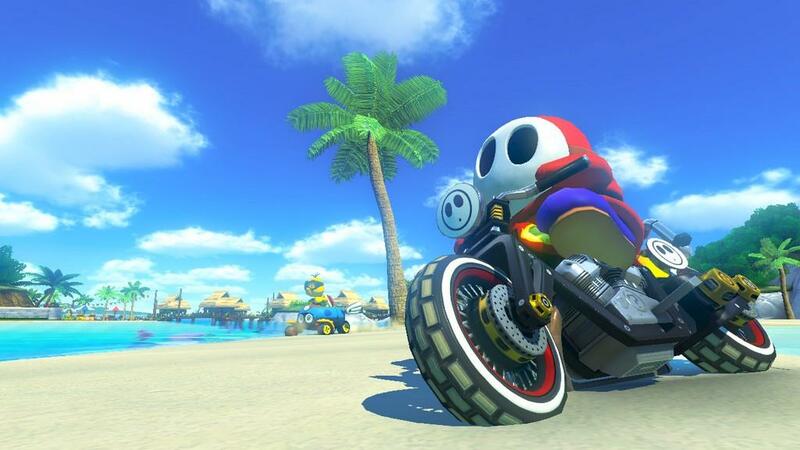 Items play a huge role in the Mario Kart franchise and this time around they've received a few new ones, along with one that has major implications for whoever is in first place. The spiny blue shell, long the bane of anyone in the lead, has finally received a new counter in the form of the Super Horn. This new item can blast away anyone within close proximity of your kart, and can destroy items near you, including that impending blue shell. There is also the addition of the Crazy 8, successor to the Lucky 7, which gives you eight different items that can be used one at a time and include a mushroom, green shell, red shell, blooper, star, bob-omb, coin, and banana peel. Another new item added to the game is the Piranha Plant, which can chomp on nearby drivers or get rid of hazards in front of you. Lastly there's the boomerang, which can be tossed in front or behind you and will return two times, disappearing after the third toss. Item distribution is still weighted based on your placement in the race, so while it is possible to get the Super Horn while in first place it is a rare occurrence. But man does it feel good to destroy a blue shell that's hot on your heels. If you're looking for more of a straight racing option, the game offers plenty of customization outside of the circuit races. Or you could go to the game's Time Trial mode, which gives you three mushrooms, and says good luck. You can opt to race against Nintendo ghost data or your own, or you can even download ghost data, and store up to sixteen different ghosts to give you insight on the best lines for a course. In addition to this, you can upload the highlights of your races to the game's Mario Kart TV app, which also lets you upload your videos to YouTube, however, at the time of this review that feature was down due to server maintenance, so we cannot comment on its functionality. 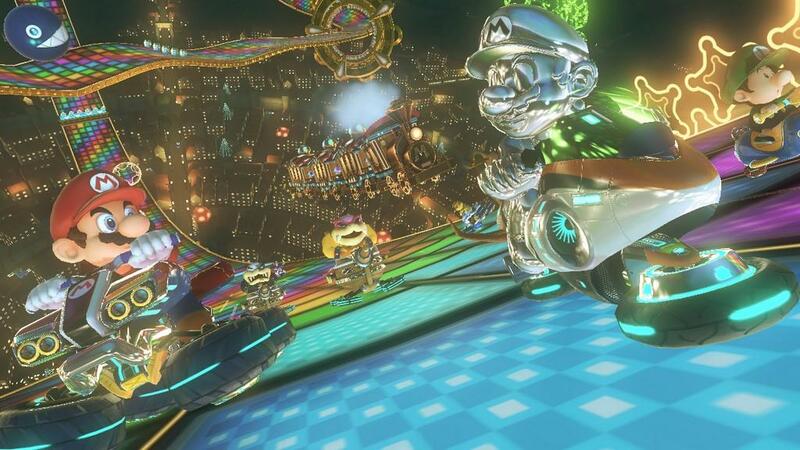 If you're getting some friends involved in your Mario Kart 8 sessions, and you should, then you'll find that the new revision to the Battle Mode makes for an interesting shake-up to the old formula. Instead of racing around battle arenas, entire courses are your playground, and you can add computer controlled karts to the chaos. Initially I wasn't really sold on this change, as playing with four players on a large course makes for a boring experience. Then we decided to add the computer controlled karts and found it made a world of difference. Being knocked out also doesn't mean it's the end of the round for you, instead you can spoil the fun of those still in the game, although you won't earn points for taking out players that are still alive, it makes the game a lot more hectic toward the end of rounds. If you're not immediately able to get some friends into some local multiplayer, there is the online option, though it is strictly racing. So, how about those visuals? Mario Kart 8 is easily the best looking WiiU game to date, and it also does a great job of being a showcase piece for the console. This game looks so good at times it's amazing to see what a first party development team is capable of considering all the derision directed toward the power of Nintendo's console. The courses, character models, and even the periphery are incredibly detailed, all while pushing some impressive visual effects on the side, like when coming out of water, or the fireworks present on the Rainbow Road N64 track. It's all running at a smooth sixty frames per second in 1080p, until you take the game to split screen multiplayer. Then things start to dip quite a bit, not to the point of being unplayable, but there's a definite loss in visual fidelity. Also if you can, stick to playing on a television. The WiiU gamepad is a decent conduit for playing the game, but from a visual standpoint, the screen's just not up to the task of presenting such a beautiful game. 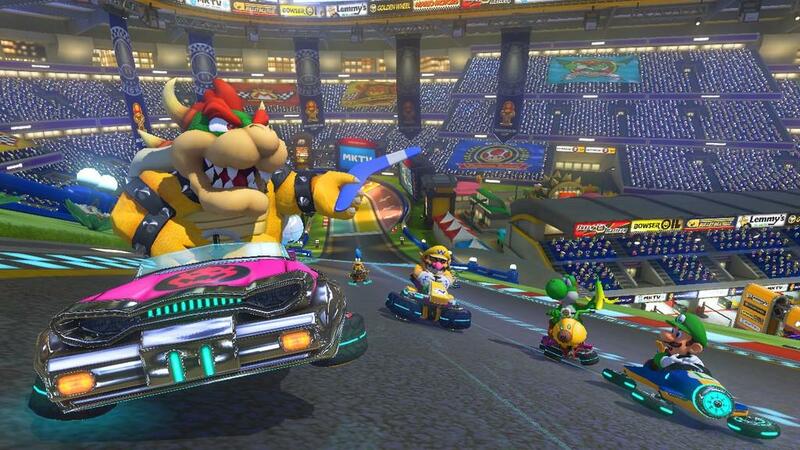 The music of Mario Kart 8 is also a spectacle in its own right. The live band approach to a number of the game's musical tracks is a great addition and just adds another layer of polish to an already lustrous package. The remixed and upgraded tracks from the remastered courses also sound great and while they aren't all full band tracks, they still sound excellent. Mario Kart 8 is everything I could have hoped it would be. After feeling a bit jaded by Mario Kart Wii and Mario Kart 7, it's great to see that Mario Kart 8 is quite simply the most fun I've had with a game in quite a long time. It's a stellar game on its own, and bringing some friends along makes it one of the greatest games ever made. If you were waiting to pick up a WiiU, this is the game to get one for. If you already have a WiiU, consider this a justification of your purchase. Nintendo has truly outdone themselves with Mario Kart 8, the new anti-gravity mechanic gives the game a fresh taste without altering the core of what makes the Mario Kart games so much fun, and for that, kudos. 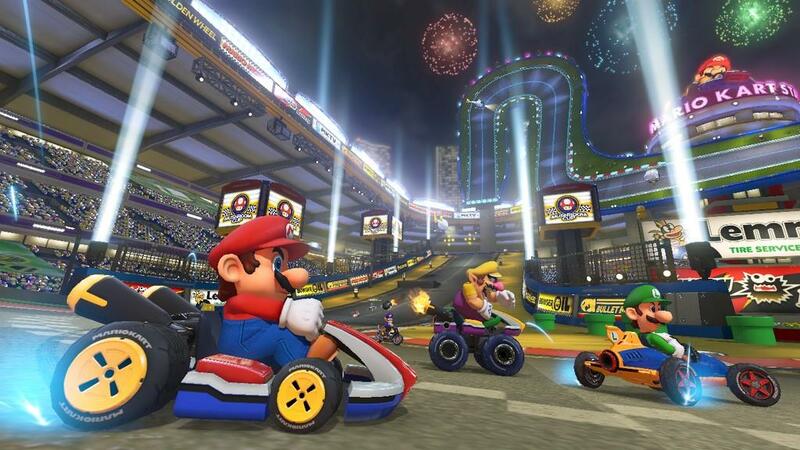 Mario Kart 8 is the new showcase title for the WiiU. If the fantastic visuals were never a hard sell for you, know that the gameplay really makes this game a must own for any WiiU owner.